Try as I might I just can’t find a video that can be embedded to watch today’s Senate hearing on the AT&T/T-Mobile merger. While you should definitely catch our recap of the days news, nothing is going to substitute watching it all unfold for yourself. Hit the CSPAN link below and make sure to block out a few hours. Which website can you watch it on? Did you see the link at the end of the article or the last sentence of the article? David shared this link with me earlier today. Make sure to click the pop-out button & it gets a little bigger. Well worth the 2 hours & 13 minutes. Worth watching. I Love u Gigi Sohn :D lol …. Do not let this merger pass!!!!! 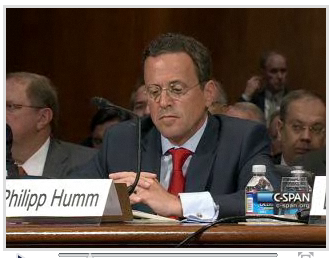 Humm was mum, and whATTs his face sounded like a perfect senate candidate in deflecting questions. Maybe Magenta will be 3 billion richer in the near future! Isn’t it possible that TMO begins to lose money as a result of facing death and a great deal of the $3B will only put money back into the bank? Their net income has slashed by more than half over the last year and that’s WITHOUT the possible ATT merger. Next quarter, $70M, quarter after that, $35M then negative. This decrease will undoubtedly be accelerated now that the company is “going under” and in 9,10 months TMO could possibly be seeing red. $3B will NOT be more like a band-aid for the huge decrease in profits that have occurred and will continue to occur for some time beyond the cancellation of the proposed merger. Then, how does TMO begin to turn things around??? But they already are a value leader. And the 1st quarter net income loss was year over year from 2010 to 2011. The Merger announcement didnt come until late March so one week of knowing there could be a merger did not affect the overall loss. I think that unless DT publicly commits to TMO USA and very obvious changes are made, T-Mobile will continue on their downward path. TMO USA can’t save TMO USA at this point. Anyone else notice old Danny Boy’s tie?? Looking a little Magenta there,Buddy! I’m just a little worried about what happens if AT&T can’t buy my beloved T-MoUSA; I REALLY don’t want to be apart of AT&T Mobility because I hated them when I had them,but will Sprint try to pick us up?? I won’t go CDMA,I won’t!! You do know that our 3G/4G network is WCDMA right? You’re totally right,I should’ve meant Sprint’s CDMA! hehe…LONG LIVE (CARLY) THE QUEEN! Unfortunately this merger is going to go thru. In watching these hearings there is no doubt in my mind now that it will. I’m really disappointed in our congressman. I don’t think that they were asking them the right questions. One being about cellphone plans. They did not with definitely ask them if we upgrade our phones would we be able to keep our plans. All they said was that we can get a like phone if it falls in a coffee cup. I wanted to hear that no matter what phone we decide to get we can keep our lower price plan. I’m disgusted with this merger. I worked for ma bell and cingular and still have friends that do and I can say without a doubt that the company is the devil in disguise. If you want to upgrade your phone , buy the next one without a contract. That way you can keep your grandfathered T-Mobile plan until it expires. My guess after it expires though AT&T will want you to sign on with them or you can move on to a new company. It will cost more up front but you will savings in the end is worth it. yeah like @a571d64b0b00eb7b2095dd2884d526dc:disqus said your gonna have to buy a “comparable” phone in order to retain your TMO rates. As soon as you want to upgrade (which is getting something for extremely cheap or even free courtesy of AT&T at that point) then your gonna have to sign a new contract with who? TMO? nope, ATT with ATT rates. Can you blame them tho?? And most importantly to remember is the word he used, “comparable” phone. That probably means that lets say the upcoming Sensation or even the SGS2 is NOT comparable to ANY LTE phone that ATT puts out. You can keep your grandfathered rate plan if you buy another premium “basic 4G” device but I’ll bet $100 that ATT will consider their LTE or even 42/84Mbps HSPA+ devices not comparable to your slower speed device. I’m not guaranteeing this is the case or anything but it won’t be hard at all for ATT to weasel their way into forcing us to assimilate by calling our phones non comparable. Also, with VZW and ATT having a duopoly, they can up the price of LTE data plans so that there is lets say a $20/30 or $25/35 option for 3G/4G.At that point they will call your TMO phone a “3G” phone or “Basic 4G” and say if you want to operate our shiny new LTE device( or advanced HSPA+) then you have to accept our new rate plans. Based on what Humm stated, explains why Tmobile marketing is lack-lustered in promoting all the great things Tmobile offers to consumers, that other carriers do not have. Niche-marketing is a good tool if you use it, or at least try. Tmobile hasn’t tried to stand out in the crowd, because they just want to get paid and Humm can move on. Look at the lame advertising of Tmobile. Nothing innovative or to show what makes Tmobile special. Less competition will not lower mobile plans, and will not encourage having the latest toys. This was pretty enlightening. I just heard on record that even month to month ppl like myself that my rate will not change for my even more plus plan. This deal will happen. I applaud those who fought for the consumer as well as their lively hood in the communication industry. dbell, unfortunately, you do not know all aspects of this merger, so I can see how your response would be what it is. If you pay attention closely, you will need to be on contract and once that contract expires, if the deal goes through, then ATT has the ability to charge you more for your services. It would be at the end of your contract that you would need to make a decision as to whether or not you want to stay with ATT afterwards. If you do not have a contract, then you are not protected from price hikes. My best advice, since i do work for T-Mobile, would be to say get ona contract, 1. you have nothing to lose. if the merger happened, and you did not want to tstay with T-mobile through it, you can usually be released from it without penalty. 2. You win as a customer either way becuase you get to either leave with no etf, or stay and have supposed guaranteed pricing on your existing rate plan, and see how the coverage is, and once it is over, you can leave with no penalty. It is funny to hear people say they are choosing not to upgrade their phones, which is their right, but they are doing themselves a disservice. Remember if you have issues with your device, and you are eligible for a new phone, go ahead and upgrade. The senators, from what I have heard, are doing a better job at pressing avoided questions. But I never understand why they (not just in this circumstance but in all senate hearings) don’t fully require questions answered. If I was a senator, and I asked a straight forward question, I would repeat myself until it was answered. After watching this, this merger will not happen. AT&T does not use 1/3 of the spectrum it has now, and they just bought some of the low 700 mhz spectrum during a resent auction from FCC. I did not know about another purchase from Qualcom. This is unbelievable. They claim to need T-Mobiles spectrum to bring LTE. It is an out right lie. They have more spectrum then any other carrier. They MAY HAVE more reserve spectrum then all the other cell companies combined. I do not know where to look up these stats. But I feel without a shadow of a doubt, that if T-Mo is sold to them, they will have more spectrum then all the rest of them combined. Duopoly, BS, the is a full blown monopoly of every piece of available spectrum. You do know if they are allowed have T-Mo,they WILL have a MONOPOLY on the whole GSM spectrum in this country. Hell the CEO of Cellular South said ” one of our BIGGEST CHALLENGES,” and turned to The CEO of AT&T during the senate hearings, and said “we have been trying to get AT&T to give us a 3g data roaming agreement.” And said even though the FCC has made roaming agreements mandatory a month ago, we been told the roaming guy is out of town. Mr Stephenson started smearing the BS right away. He said he started talking about roaming in generalizations, then said we are open to roaming agreements, then said Meena is on a different technology. Meena interrupted with, we do have GSM property. Mr Stephenson interrupted with, WELL, lets just talk after the hearing. (like buddy buddy) Then Grassly interrupted with, talk business later, which got a big laugh. Grassley total blew it. There playing out right in front of him, is what all the small carriers are going to face. Death through starvation. AT&T 3G is going to look awesome in north Alabama, and because they wont let Cellular South share in their 3g data GSM spectrum, Cellular South will look like an inept phone company any start lousing its customers to AT&T. AT&T will probably roam with some companies (big) and tell other companies (small) sorry, we don’t have any spectrum left. Die. Grassley should have picked Meena brain to see what is like to deal with AT&T. I know I would have. AT&T is on its way to have phenomenal spectrum holdings. Not only will they make tremendous wealth with these holdings, but they will be able to enslave or destroy other cell phone companies.